The decline was largely anticipated; fairly volatile employment data created large movements in the measure in recent months that overstates the volatility of the economy. The moving average measure, which smooths out the volatility, continues to track near a value of roughly 1.0, consistent with previous expansions but somewhat below the pace of earlier this year (“zero” indicates average growth over the 1990-present period). All sectors covered contributed positively to the measure. Weakness was largely contained to the employment indicators. 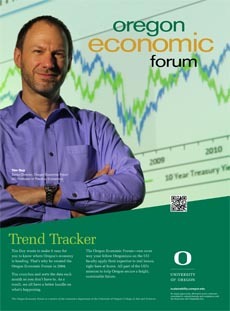 The University of Oregon Index of Economic Indicators edged down in November after a solid gain the previous month. Employment services (mostly temporary help workers) declined modestly, while initial unemployment claims edged higher. The latter remains at a very low level consistent with solid job growth. For the most part, changes in individual index components were modest.